I was pretty excited to order the new iPad Pro when it was announced. I’ve mentioned a few times that I have the 12.9″ and the 9.7″ and I was curious what they would do with the form factors and what model I would choose. When they made the 12.9″ screen come in a smaller form factor, I was sold. It’s possible I could have loved the 11″ but I couldn’t see giving up all that glorious screen real estate. I like to have my iPads sit up at an angle for watching videos, and occasionally for typing so the Smart Keyboard Folio seemed like a good purchase as well. Then in a weak moment, with no reason other than curiosity, I had them throw in a Pencil. You’ve read all of the “hot off the presses” reviews, so I thought I’d wait a while to see how the new iPad Pro feels after a few weeks. My point of view will be coming from the 2nd generation 12.9″ iPad Pro to the 3rd generation. I’ll start by talking about the iPad and then Pencil, but to be honest, the star of the show is the Smart Folio Keyboard which I’ll talk about last. The big thing everyone is talking about with the new iPads Pro is how wicked fast they are. The Geekbench scores are higher than most Macs and it has everyone in a big tizzy about it. Apple says that they’re faster than 92% of PCs shipped in the last year. When I bought the new iPad Pro, I figured it would be a huge improvement over my 2nd generation iPad Pro in terms of speed. I assumed that my hair would blow back at the speed. Might even need a neck brace because of the acceleration. But then I realized, what do I do that actually stresses the processor speed of the 2nd generation iPad Pro? Apps already launched quickly. High-resolution video plays back just fine. When I type using the on-screen keyboard, the little animations show my typing exactly as fast as I type. Swiping left and right to change apps has always been as fast as I’m swiping. I’ve been trying to come up with a way to measure the speed difference because it isn’t inherently obvious to me. I don’t do much video editing, but I brought in some clips into iMovie on both iPads and did the same edits and exported to the same format. It wasn’t a big video, but it took a few minutes to export, and the two iPads finished it in about the same length of time. I tried doing gaussian blurs on complex, multi-layered sample-image documents in Affinity Photo, but both iPad Pros rendered the images instantly. I guess that’s a testament to Affinity Photos algorithms and how well tuned the app is to the iPad interface. If photo editing wasn’t going to tax the machines, how about audio? I had heard that compressing audio files using the digital audio workstation software called Ferrite for iOS takes a while so I finally broke down and bought it. I’ve been playing around with the free version on and off for a long time, so I stopped procrastinating and finally gave them the $30. I’ll give you some impressions of Ferrite later, but it did give me an opportunity to test the speed of the two iPads. Exporting a one-hour, uncompressed 600MB stereo recording down to MP3 took around 3 minutes on the new iPad and around 3.5 minutes on the old one. I don’t know about you, but 30 seconds for an extra thousand dollars? I guess if you do it all the time and you’re paid by the hour it could be worth it. If you have a really old iPad, maybe the new A12 Bionic will blow your socks off, but if you have any model iPad Pro, I’m not sure the speed is a good excuse to upgrade for normal folks. I do have some observations other than speed. Face ID is, as expected, positively delightful. Even though I have the perfect finger dampness to make Touch ID work quite consistently, Face ID is so much faster, especially on the new iPad Pro. Goopy fingers, wet fingers, fingers that are too dry, none of these are a problem when you have Face ID. 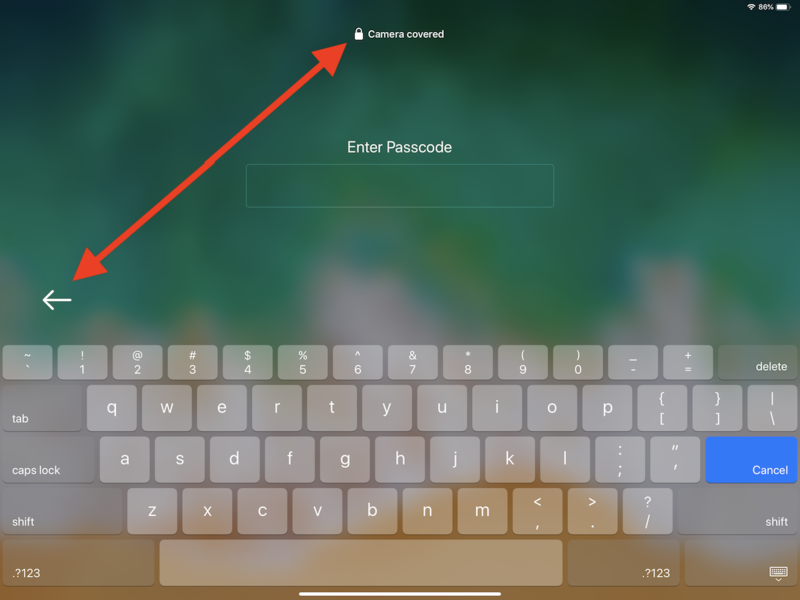 Using Face ID with 1Password and the tight integration into iOS 12 is simply dreamy. The new, 3rd generation iPads Pro have a very small bezel around the edge. It is quite natural to grab the iPad on the left bezel to pick it up. This puts your thumb perfectly over the Face ID sensor. You can’t really see the sensor so you’ll wonder why the iPad isn’t responding to your face. But clearly, Apple engineers did the same thing when they picked it up because two on-screen indications will come up to alert you. When you try to use Face ID with your thumb obscuring the sensors, you get a little bouncy arrow pointing at the camera, and across the top it will show “Camera Covered”. It seems to me that they could have moved the camera to a position where our thumbs wouldn’t cover it instead, doesn’t it? Maybe making it work in all four orientations was a higher priority. It does remind me of a piece of furniture Steve assembled recently. After hours of work, he realized that they didn’t give him enough shelf pegs. He was distraught as you can imagine. I looked in the giant box and saw an orange piece of paper that said, “Look at the foam to see if the parts are stuck to it.” Sure enough, the little pegs were in a plastic bag that had gotten stuck to the foam. Instead of redesigning the packaging so the problem wouldn’t occur, every single box by that manufacturer has to have a piece of paper put inside it. I will think of that little paper sign every time I put my finger over the Face ID sensor! I am delighted that the new iPad Pro uses USB-C. You may be like Sandy in our Slack group podfeet.com/slack who has invested in a lot of Lightning cables and was a little annoyed she’d have to start buying USB-C cables. But for those who have already bought another USB-C device, like one of the newer MacBooks, it’s a delightful change. On my trip to Lindsay’s for Thanksgiving, I only had to bring one cable and the MacBook Pro charger for both devices. When I wanted top performance for my Luna Display to drive my iPad as a secondary display, I was able to use the same USB-C to USB-C cable to connect the two. I think after you get one USB-C device, you’ll want everything to be USB-C. The Pencil and the way it charges now is good in the sense of, “how dumb was it before?” I took a photo of the two iPads side by side, the old one with its Pencil sticking out of the side looking like Steve Martin with the arrow through his head, and the new one with Pencil stuck to the top with surprisingly strong magnets. Sort of like how it feels good to stop hitting your head against the wall. Like I said up front, I didn’t need a Pencil but I’ve been having some fun drawing and then double-tapping the flat side to get to the eraser. Works great in Notability by the way so that will be fun to use in the future. When I bought the original iPads Pro, I got them with the Smart Keyboard. I liked them well enough. The Smart Keyboard is thin and light, and typing on the keyboard was passable. Folding and unfolding them was a bit of origami (if Helma will forgive me the analogy). They didn’t cover the back of the iPad but for some reason, I never scuffed up the backs of my iPads. I can’t say I’m a huge fan of the Smart Keyboard since I did have four or five of them fail on me over the years. The new iPads Pro have a newly designed keyboard called the Smart Keyboard Folio. There’s a lot to like about the Keyboard Folio, but the first thing I noticed was how heavy it is. It covers both the screen and the back which I suppose is a good thing, especially with the camera bump. But the new iPad Pro is so very light, weighing 7.5% less (1.8 oz) than the 2nd generation, and yet you slap the Folio Keyboard on it and it actually weighs a tiny smidge (0.2 oz) more than the old model with its Smart Keyboard. We are definitely splitting ounces here. 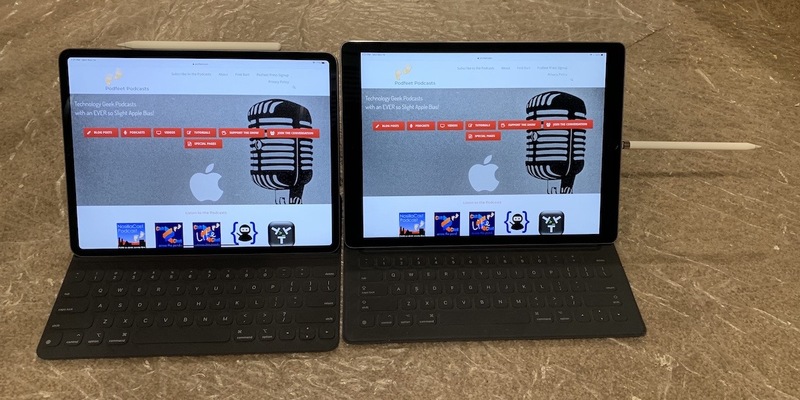 My point is you may be hearing people talk about how light the new iPad Pro is, but if you use the Smart Keyboard Folio it weighs about the same as the old one. Weight aside, I find the Folio Keyboard itself positively delightful. It’s almost clicky even though it looks pretty similar to the old keyboard. I love typing on it. I don’t dislike the MacBook Pro keyboard but I’m finding myself actually choosing to use the iPad Pro for real writing where with the old one I would immediately set it aside for the Mac. The keyboard folds in a much more user-friendly way, with no origami talents required. It has two angles for viewing, one of which is quite pleasing, the other of which is so straight up that I think it must be designed for airline travel in coach class. The weird thing is how it folds up when you want to use the iPad as a tablet lying flat. When you fold it that way, the keys are on the back. If you lift it up to carry it like that, you’ll be smashing the keys. It doesn’t appear to mess anything up but it feels pretty weird to me. The bottom line is that if you have any generation of iPad Pro, I’m not sure you’ll be able to justify the purchase of the new model based on speed. I’ve challenged a few people lately on their public statements about the speed, notably Jeff Gamet and Dave Ginsburg, and they both said that they haven’t been able to measure a speed increase. Jeff did say that scrolling looked better and faster to him on the new iPad Pro, but that it was the 120 Hz refresh rate that was at work here. However, if having a bigger screen in the same size with the 11″, or having a smaller device with the same glorious 12.9″ screen is exciting to you, then definitely go for it. If you need a keyboard that’s much better than the old Smart Keyboard, then I can highly recommend the new Smart Keyboard Folio. I have to say, with that great new keyboard, it’s become more and more of a productivity machine for me. Just got the Pro 11 inch. Had Pro 10.5. Not really sure I’ll keep it but have two weeks to figure that out. It is a bit depressing to have to buy new cords and cables, Pencil 2 and some sort of case. Face ID is a big plus for sure.